Footage from "Carol Channing: Larger Than Life" of Carol Channing and the "Dolly Boys" at "Gypsy of the Year" program on Broadway. Photo by Peter James Zielinski. TWO of several icons – Carol Channing and Yves Saint Laurent – get the documentary treatment at the 10th Annual Tribeca Film Festival. Whereas “Carol Channing: Larger Than Life” is a love letter, “L’amour fou (Mad Love)” is a postcard – a delightful one, with a few throwaway bits. Carol Channing shows off her "Hello Dolly" headdress in "Carol Channing: Larger Than Life." Photo from Dramatic Forces. 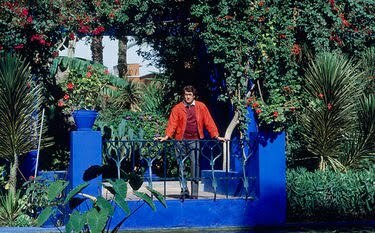 The documentary hangs on a flimsy premise: the sale of the uber impressive art collection of business and life partners, YSL and Pierre Berge. It is a lot to hang 100 minutes on, and director Pierre Thoretton making his feature film debut, wisely does not do so. L’amour fou” is nominally about the art, and what a collection amassed over more than 50 years. Who knew it would start with a Mondrian painting? PB gives brief bios of various arts and objects as they are being packed and and prepared to ship for auction at Christie’s. 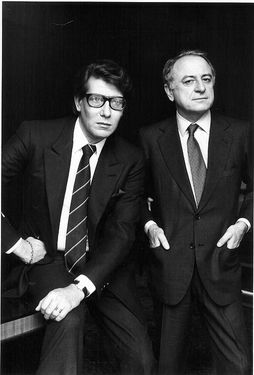 Partners Yves Saint Laurent and Pierre Berge in "L'amour fou." Photo from 2011 Alice Springs/IFC Films. The film also provides a backstage tour into the life of one of the world’s greatest designers, as well as a window into the life of PB. The latter is not so interesting and seems like filler. PB is an engaging and informative tour guide. However, a little of him goes a long way. The homes, though, oh la! The biggest treat in L’amour fou” is the archival footage. There is a young, gangly YSL when he was tapped out of obscurity to design for the House of Dior after the death of Christian Dior. Fooling around in front of the camera, he agrees to be the interview subject of a mock serious PB. In answer to the query about what makes him happy and what make him sad – a full bed and not a full bed. Included, too, is footage of the exquisite and elaborate wedding gowns over the years, the standing ovations after the shows, the spectacular show at a stadium featuring 300 models from five continents. YSL’s last walk down the runway at his retirement. Much of this is goosebump-producing. Yves Saint Laurent relaxing at home during the off season. Photo from 2011 IFC Films. Not an insignificant amount of time in “L’amour fou” is spent on YSL’s struggles with drugs and alcohol. It’s more titillation than edification. The film could have done nicely without it. Another 20 minutes could have been saved, too, had there been less focus on PB analyses of YSL’s state of mind and PB’s close association with Francois Mitterrand. And while PB’s work in the cause of AIDS is admirable, mentioning it seemed a tad self-aggrandizing. The last frame in “L’amour fou” is of PB starring blankly back at the camera, presumably after the art has been sold. Incidentally, the collection sold for millions; one piece sold for 22 million euros. The final tally: Who knows. Yves Saint Laurent with mannequins. Photo from 2011 Pierre Boulat/IFC Films. Stay tuned for more from the 10th Annual Tribeca Film Festival http://http://www.tribecafilm.com/).